Backstepping a bit to last week’s post, titled For the Love of Basements , where I included not a single picture of a basement, one of our great loves, I thought I’d better fill in with some visual proof. Basements were where we could do what we really wanted—make things look old—without censure from our buyers. 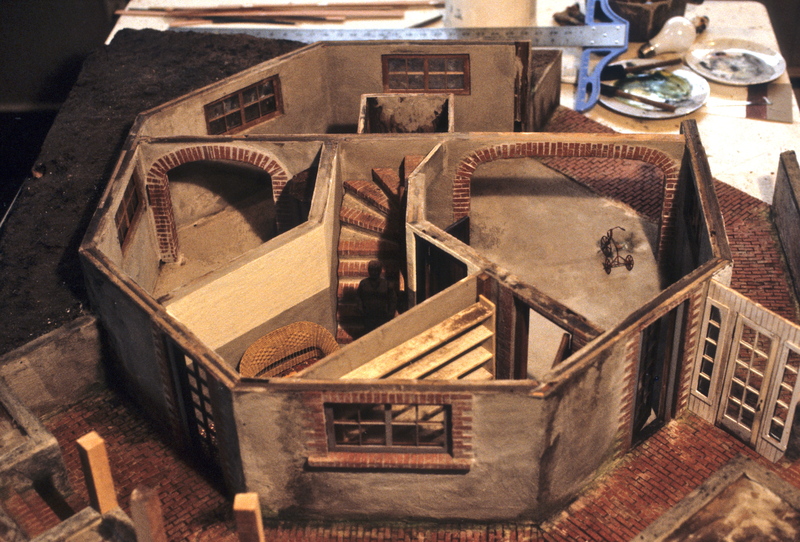 I’m not saying the buyers would have refused aging, but in 1977 dollhouse funk was still a new concept, and many were not quite ready to have a house on display that showed major signs of decay or neglect. 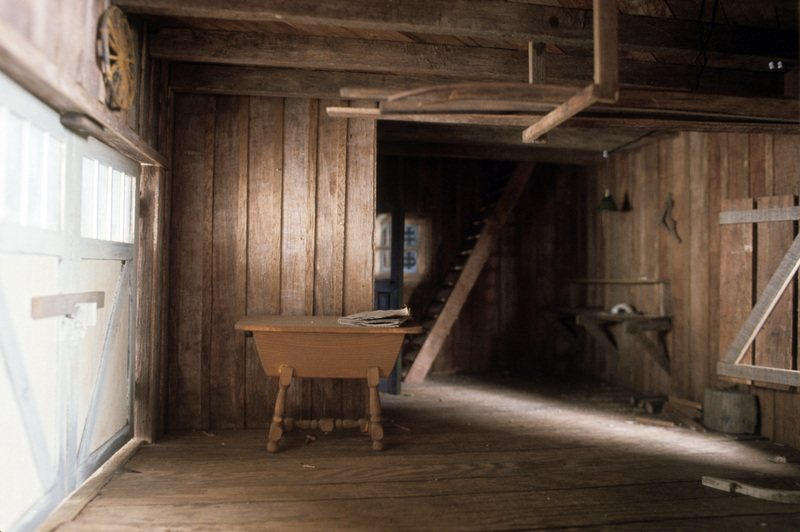 As long as they had their pretty upstairs rooms, we had room for our own imaginations in the foundations, basements and attics. 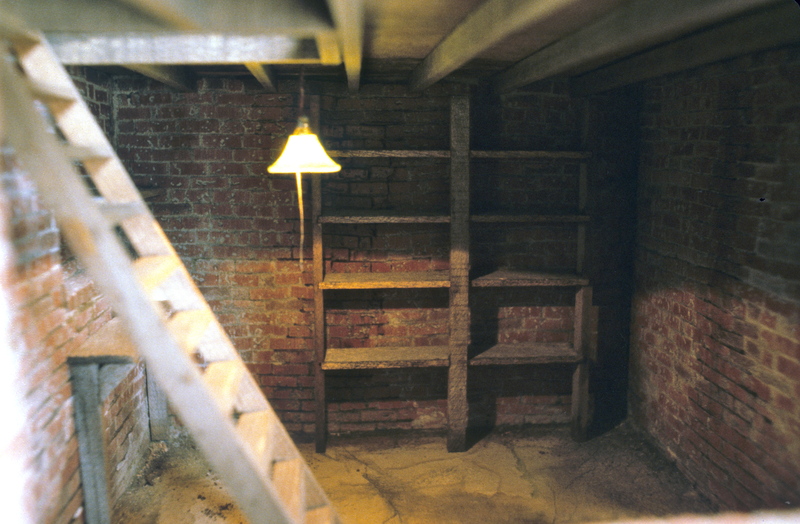 As a child I was drawn to basements—for their smells, the mystery of dark corners, furnaces, and shelves lined with jars of unknowable things. Not to mention the crock of fermenting elderberry wine the cat fell into one winter. Odd for me, as in most cases I was the family scardey-cat. 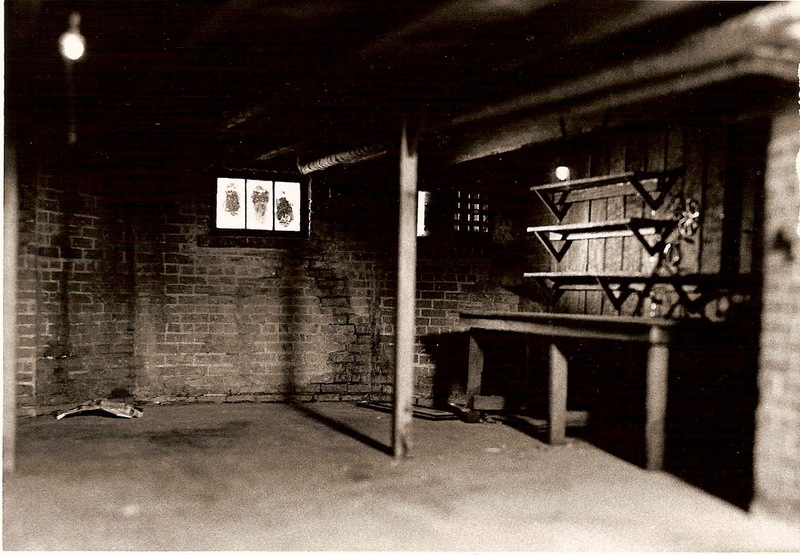 Granddad’s basement in Massachusetts was a highlight of visiting him, which I remember for a particular earthy/pungent smell—somewhere between creosote, turpentine, mold and hardwoods—an evocative and comfortable scent I still run across in friends’ workshops, garages and basements. One whiff and I am back in childhood. My father had a workshop in the cellar where he went to “putter,” which was Dad-speak for getting “out from under the female population,” and repairing frying pan handles or loose chair legs. He built an ingenious system of jar tops into the ceiling, into which he could screw jars of screws and nails of assorted sizes and types, something he never had in short supply. The walls were granite blocks, thick enough to maintain a constant, comfortable temperature, no matter what the weather. In 1955 it sheltered us during the furies of hurricane Diana, which whirled up huge trees and turned our lower lawn into a raging river. I felt protected and safe, despite roaring winds and the spectacle of devastation we watched through the one tiny window. Our 200-yr.old farmhouse was spared major damage, and Dad used the tree-fall for firewood for the next 20 years. Noel shared that lure of underground rooms with me, though we never really spoke about it—we just enjoyed recreating what they felt like from memory. Once we found a “vacant” lot with a pile of rotting wood. It was so riddled with bugs that most of it collapsed when we picked it up. Some, however, was intact, and full of tiny holes, not to mention one of those earthy, unknowable smells, at least after the rot odor dried out. At home we laid it out in the yard, hosed it off (it wasn’t even fit for the garage), allowed the bugs to make their own departure, and the sun to dry it out. For years it was our source of basement ceilings and shelving. 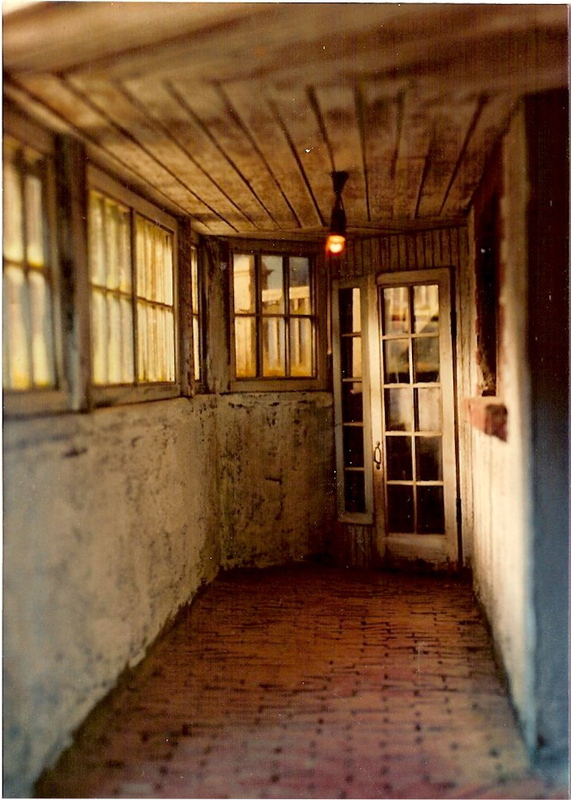 In the case of The Octagon House (1982, last seen in Amagansett, NY), most of the basement rooms (6 of them!) could never be reached or even seen after construction, so they remain a mystery to the owner. At least one of them holds a cache of mini furniture, never to be seen, and lighting fixtures that have no doubt long burned out, just to tempt you into looking. Our hope is that some sleuth spent time with a dental mirror and flashlight to find at least some of it. Somewhere we have a photograph of the furnace Noel built for it, which will be the subject of another post. My current Type-A self sometimes wonders at the kind of people who would spend weeks building rooms in full detail that would never be seen—obviously people for whom the clock and dollar were, at best, a nuisance. 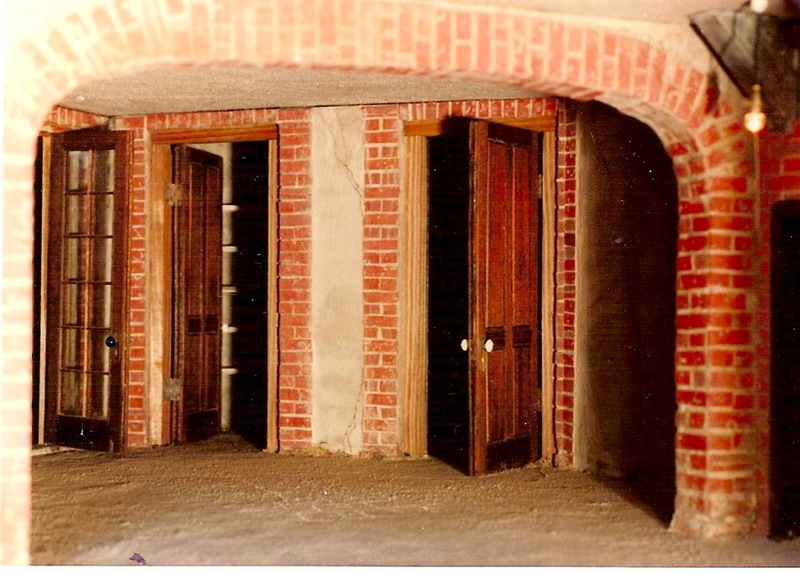 This entry was posted in Miniatures and tagged architecture, basements, dollhouses, lifestyle, South Bend, The Octagon House. Bookmark the permalink. I think I would explore the octagon basement with one of the snakey, remote viewing, fiber optic cameras. That way I could record the journey on video! I love your octagon basement! I can visualize my parents basement with all it’s dark scary corners. (only scary because of the spiders (ick!) other than that I loved spending time down there watching my grampa at his workbench with all his little drawers and cubby holes. I also loved the smell of the wood and dirt and probably mold and burnt coal. Thanks for bringing me back there. That was a smell I was always hoping to re-create, but it’s elusive–probably had shellac, creosote and turpentine in the mix. It was my grandfather’s basement and garage that we kept trying to recreate.